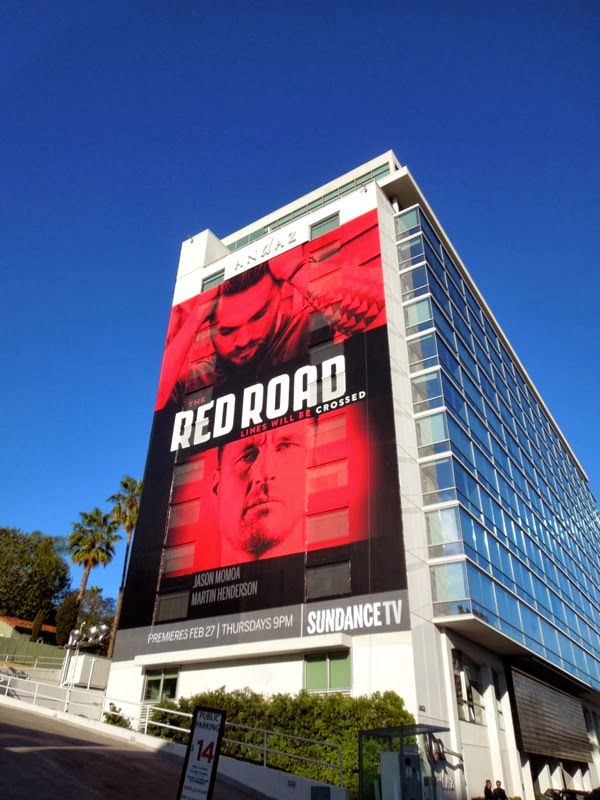 Now here's a striking giant-sized billboard for the new original series from the Sundance Channel, The Red Road. Fan-favourite Jason Momoa, who played 'Khal Drogo' in Game of Thrones and the new Conan the Barbarian in the 2011 movie remake, stars alongside Martin Henderson in this gritty new show about a local sheriff (Henderson) struggling to keep his family together, whilst at the same time policing two clashing communities, the small town he grew up in and the neighboring mountain home of a Native American tribe. 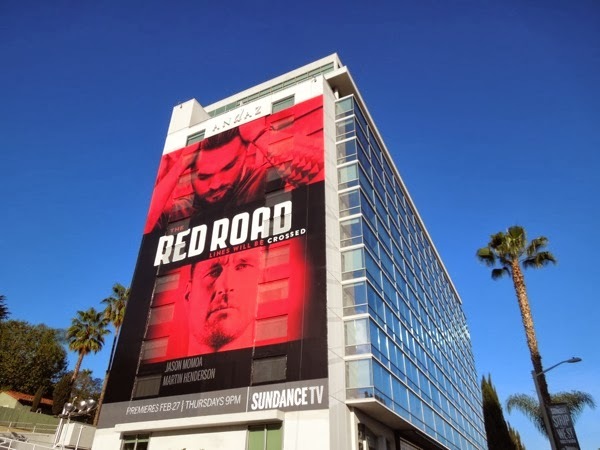 The sheriff forges an unholy alliance with a dangerous member of the tribe (Momoa), when a terrible tragedy and coverup occurs involving the cop's own wife, which will come back to haunt all involved and lines will be crossed. Sundance TV seem to like these hard-hitting shows, as their first original scripted series Rectify, was equally gritty and compelling. 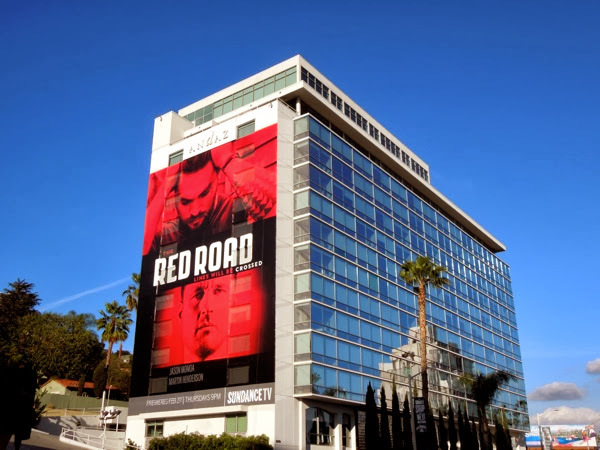 This super-sized ad creative was spied on the side of West Hollywood's Andaz Hotel along Sunset Strip on February 7, 2014. 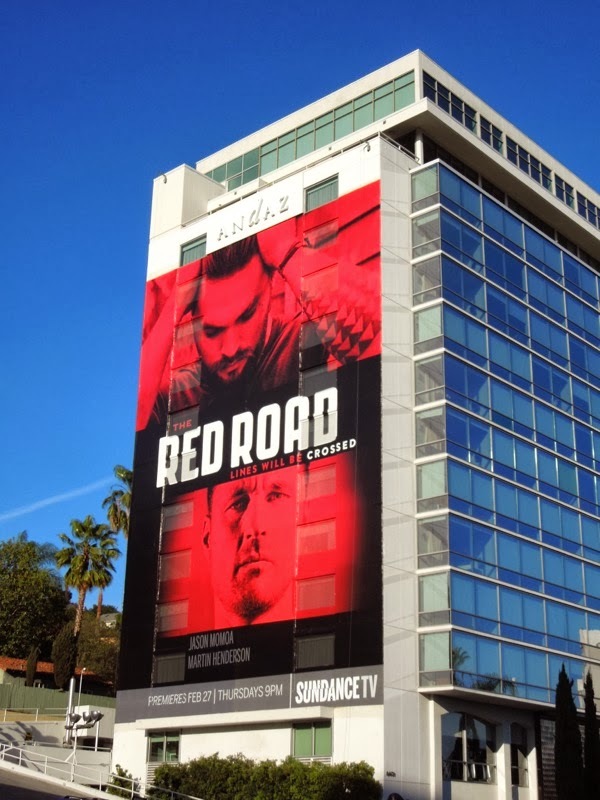 Daily Billboard's only observation about this series launch billboard, is that it suffers a little from the fact that The Americans season two billboards are also a bold red colour currently filling the skies of L.A., so its overall impact is lessened. 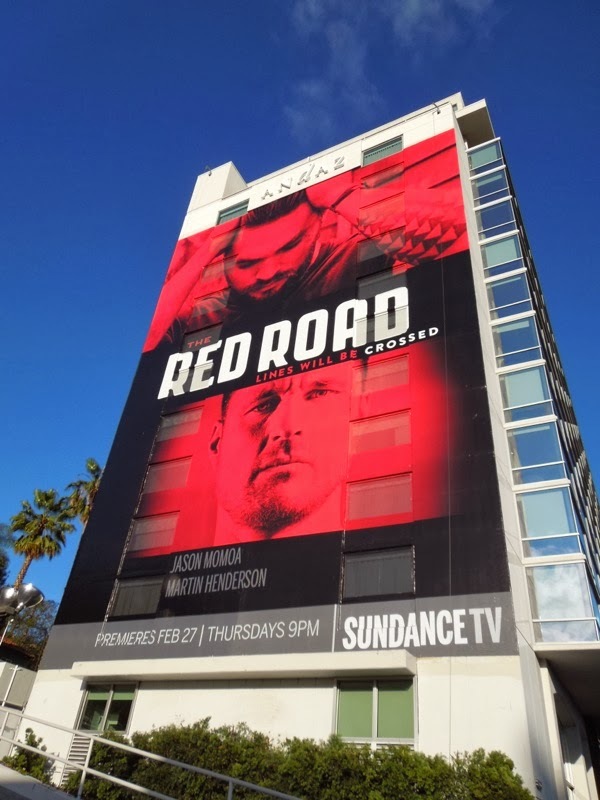 Be sure to also check the show's stars out in these other billboards, Jason Momoa in this Conan the Barbarian movie ad campaign and Martin Henderson in these series launch billboards for ABC's Off The Map from 2011, which only lasted one season.